A Ryobi planer comes in three different flavors at the moment: the AP3101 benchtop planer (now discontinued), the HPL51K electric hand planer, and the P610 cordless hand planer. All three get good ratings and reviews, and are excellent tools for the homeowner or hobbyist that is on a tight budget. No, they don't have all the features or the heavy-duty construction of professional-grade models, but they are considerably easier on the wallet. If you aren't going to be using it every day (or even every week), there isn't any need to spend hundreds extra on a woodworking tool that is going to spend more time collecting dust than making it! A Ryobi planer will get the job done with a minimum outlay of cash. First up, we have the Ryobi AP1301 benchtop planer (now discontinued). It has a width capacity of 13" and a height capacity of 6". Like most 13" planers, it comes with a 15 amp motor. The cutterhead has two double-edged blades and provides 66 cuts per inch. The maximum depth of cut is 1/8", and the feed rate is 26 feet per minute. At only 54 lbs., the Ryobi AP1301 is one of the lightest portable planers available, making it easy to lug around when needed. But the light weight also means that it needs to be clamped down to a workbench or table for anything more than light-duty work. It doesn't come with infeed or outfeed supports like many other portable planers do, so it will benefit from adding external supports. - I will say that I am pleasantly surprised with the Ryobi planer. It is sturdier and better built than what I expected. It has handled everything I've thrown at it with ease, including 6" hard maple, 8" walnut, rough cut poplar, and 12" pine. Reports of snipe varied greatly depending on the user. This seems to be a common thread with MANY benchtop planers; different people get different results. Several people were able to eliminate most snipe by changing their technique, and suggested lifting up slightly on the end of the board at the beginning and the end of the operation. Adding infeed and outfeed tables also helped a lot in several cases. Feeding the board through at a slight angle and taking light cuts were also suggested. Besides snipe, the most common complaint is that the Ryobi planer has a 2-1/2" dust port instead of a 4" port, and dust collection is not up to par as a result. Several owners found that the height adjustment handle would move during use, but taping the handle in place temporarily would prevent that. One owner said that tightening the set screws slightly would also prevent that from happening. Most owners said that the benchtop planer works fine on soft woods, but some owners found that it struggles with hardwoods unless you take super light cuts. Others said it worked fine for them even with hardwoods. Different people, different expectations, different results. The general consensus among owners is that the Ryobi AP1301 is a good light duty, entry level benchtop planer, and hard to beat for the price. You have to keep in mind that this machine currently costs just over HALF that of a Dewalt 735, which seems to be the benchmark for portable planers at the moment. The vast majority of people who own the Ryobi planer are happy with it. NOTE: Since the Ryobi benchtop planer has been discontinued, the best deal I am aware of at the moment for a good quality entry level machine is the Steel City Tool Works 40100 13-Inch Bench Top Portable Planer . It currently has a 4.5 star rating at Amazon with 15 reviews. Next up, we have the Ryobi HPL51 electric hand planer. It has a 3-1/4" wide, 2-blade cutterhead. The 5 amp motor has a 16,000 RPM no load speed. The depth of cut can be adjusted from zero to 3/32" in 1/64" increments, and the blades are double-edged so the can be flipped around when they become dull. The dust port can be flipped around so you can have the exhaust on either the left or right side. The HPL51 Ryobi hand planer has a "kickstand" that prevents the blades from contacting the workbench when not in use, and the front shoe has a groove that helps guide the planer for chamfering operations. It will cut a rabbet up to 7/16" deep, and comes with an edge guide and a dust bag. The kit version (Ryobi HPL51K) adds an extra set of double-edged blades and a carrying case. 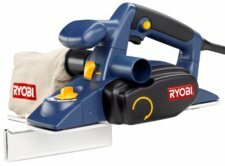 Home Depot reviewers give the Ryobi HPL51K 4.1 out of 5 stars overall with 39 reviews, and Epinions reviewers give it 4.5 stars with 2 reviews. Amazon has a reconditioned model available, and it rates 4.7 stars with 13 reviews available. People like the Ryobi HPL51K for jobs like planing down doors to fit, leveling floor joists, and straightening wall studs. The vast majority of owners were happy with the power and the quality and smoothness of the finish. The most common complaint is that the small dust bag fills up quickly. 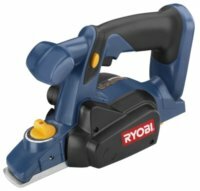 One owner said the Ryobi hand planer needed finer adjustment stops in order to do fine finish work, but it sounds like his unit was defective or needed an adjustment, because his would remove 1/32" of material even with the depth set at zero. A few owners said it didn't plane evenly and felt underpowered. A few owners didn't like the angle of the handle or the smoothness of the finish. Many owners felt like it would be hard to beat the Ryobi hand planer for the money. I only found one owner that reported a failure, so it seems to be quite reliable. Bottom line, for most homeowners, it will enable them to accomplish the same tasks as a Bosch or DeWalt electric hand planer will, but costs roughly half what some of the others do. Finally, we come to the cordless P610 Ryobi hand planer. It is part of the ONE+ family of Ryobi cordless tools, so if you already own some of the ONE+ tools it uses the same batteries and charger. The 2" wide cutterhead has two 2" wide dual-edge blades that are perfect for trimming and straightening the edges of wall studs, doing cabinet work, or trimming wooden doors. The cordless Ryobi planer has a max cut depth of 1/64", and the 18V motor has a no-load speed of 10,000 RPM. It will cut up to a 1/2" rabbet, and has a chamfering groove in the front shoe. The cordless planer also has a kickstand that keeps the blades from contacting the workbench when not in use. It comes with an edge guide and dust bag. Be aware though, that it does not come with a battery or charger, so if you don't already own any of the other Ryobi ONE+ tools, you have to figure that in to the purchase price. Home Depot lists the average owner rating at 4.4 stars, but if you read all 34 reviews, it really should be higher than that. In the only poor review it has, the owner complained that the planing width is too narrow, and the corded version is much more useful. I wonder, did the guy not read the description before he bought it??? Another only gave it 4 stars because he "doesn't give out 5-star ratings". That being said, 96% of the reviewers at this time would recommend the P610 Ryobi planer. The fact that it is cordless makes it really convenient to use. A couple of people weren't satisfied with the battery life, but several other folks were pleasantly surprised by how long the battery lasts. Different expectations, I guess. Bottom line, most owners really like the cordless Ryobi planer and say it works great. It is really handy for trimming down sticky doors or warped wall studs. I did not find any reports of failures with this one either. All three of the Ryobi planers have good reviews overall, and come with a 3 year warranty (well, the models that are still available do!). They give you the capability to do the same jobs as much more expensive tools without breaking the bank. 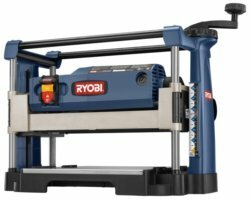 You can get all the detailed specs for the Ryobi planer models at Ryobi.com. For the homeowner or hobbyist that needs a planer for light-duty use and can't justify spending the money for a more expensive brand, a Ryobi planer will get the job done.